Structural design in fire conditions is conceptually similar to structural design in normal temperature conditions, but often more difficult because of internal forces induced by thermal expansion, strength reduction due to elevated temperatures, much larger deflections, and numerous other factors. Before making any design decisions it is essential to establish clear objectives, and determine the severity of the design fire. The art and science of designing structures for fire safety has grown considerable in recent years, accompanied by the development of sophisticated codes of practice such as the Eurocodes. The Eurocode documents now represent the best international consensus on design rules for structures exposed to fires. Similarly, codes and standards in the US and the rest of the world are being updated with rational design provisions for evaluating fire resistance of structures. One such example is the recent introduction of rational fire design approach in the latest edition of the American Institute of Steel Construction's steel design manual. 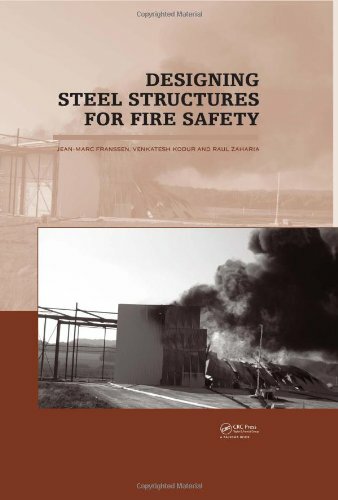 Designing Steel Structures for Fire Safety provides guidance for those wishing to apply rational engineering methodologies for fire design of steel structures. Codes alone do not provide enough information for structural design, especially as they become more sophisticated and comprehensive. This book provides background material and serves as a design guide for the user. It should help the reader not familiar with the topic to make calculations of the fire resistance of steel structures according to the Eurocodes or other code provisions. The theoretical, technical or historical background is provided when this helps the user to understand more clearly the calculation methodologies, while examples on simple elements and guidance showing how a complete structure can be analyzed are included. Designing Steel Structures for Fire Safety is a major new contribution to the wider understanding of structural behavior in fires, and will be invaluable to professionals in civil engineering and architecture, students or teachers in these disciplines, and building officials and regulators in all regions of the world. FRANSSEN, JEAN MARC; KODUR, VENKATESH; ZAHARIA, RAUL.